Dog Soldiers is produced by Christopher Figg (Clive Barker’s Hellraiser, Trainspotting) and written, directed and edited by Neil Marshall (Killing Time, The Descent, Doomsday, with a few sporadic directing gigs on the TV series Hannibal, Constantine, Game of Thrones & Black Sails.). Dog Soldiers was Neil’s directorial debut. Dog Soldiers is a 2002 UK product and if you like werewolf movies, I really think you’ll like this one for sure. It starts like any classic werewolf movie… as we watch the first few victims, well, become victims. It’s quite the classic movie start. Then there’s a scene from the past that sets the scene for today as we’re introduced to trainee Private Cooper (Played by Journeyman & Grey’s Anatomy star Kevin McKidd). We’re also introduced to a cold war-hardened soldier, Capt. Ryan, (Liam Cunningham). It’s awesome seeing McKidd in such an early role. He’s awesome. We then jump to the present with a squad of British soldiers are on a training simulation in the Scottish forest. The squad consists of Cooper, (Kevin McKidd), Terry (played by Leslie Simpson), Joe (Chris Robson), Bruce (Thomas Lockyer), Spoon (Darren Morfitt) and Sergeant Wells (Sean Pertwee). The ever boring routine of training changes instantly as they start to encounter the beasties. We follow the squad’s efforts to survive the battle. The soldiers stay focused on their own survival through a very long night up against these 8-foot tall nemesis. This is one of the best low budget monster movies I’ve ever seen and it serves its genre very well. The writing is awesome and the monsters are superbly portrayed in a mix of shadows, outlines, steaming bodies at the edge of the light. Yep, No CGI in all their simplistic awesomeness. One of my favorite scenes is when a soldier jumps in a jeep to get it back to the house they’re in. As he sits there we see the steam of an exhale from behind him. Without looking back, he just says: “You’re right behind me, aren’t you?”. His answer is a second exhale of steam. He turns to meet his end valiantly. This flick reminds me of Night of the Living Dead, monsters relentlessly coming… they’re just a bit faster in this one as I felt an overwhelming sense of despair, laced with hope. Simon Pegg was offered a part in the film, but turned it down after Edgar Wright asked him to save his first horror role for Shaun of the Dead while Jason Statham turned down the role of Cooper to film John Carpenter's Ghost of Mars. 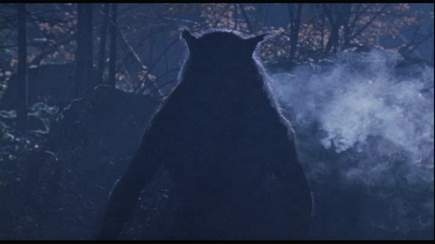 There is very little CGI used in the movie because the people involved in the filming believed that CGI was being over-used at the time and that it would take viewers out of the movie because they would be focused on how the special effects looked rather than the story, thus the werewolves are animatronics and body suits with stilts. One of the soldiers in this movie is referred to as Bruce Campbell, a reference to The Evil Dead (1981) that Bruce Campbell starred in. The Evil Dead has also been said to partially inspire the plot of Dog Soldiers. Sean Pertwee's character "Sgt. Harry G. Wells" is named after H.G. Wells, one of writer/director Neil Marshall's favorite authors. IN the middle of the film, a character plays a song on a piano, "Clair de Lune", roughly translatable as "moonbeam" and is supposedly a nod to An American Werewolf in London, which had songs with the them of moon in them.